Professor Hugo Junkers was one of the great revolutionaries in the history of aviation development. Junkers became a professor of mechanical engineering at Aachen University in 1897, where he remained until 1912, after having invented and patented gas engines, heaters, and a calorie meter among other inventions. He went full-time into aeronautical work in 1912 at age 50, when he became convinced that the future of aviation lay in the development of all-metal aircraft of advanced design, such as a flying wings. Unfortunately for Junkers, two years later war broke out and the only way he could obtain the necessary funding for his work was to develop war planes, a task he personally hated. In 1915, Junkers created the world's first practical all metal aircraft design, the Junkers J.1, known as the "Blechesel" (Sheetmetal Donkey), which first flew in January 1916. This was eventually developed into an armored ground attack airplane that was virtually impervious to ground fire when it appeared during the great 1918 Offensive. In 1917, Junkers began work on the J.7, an all-aluminum single-seater known as the J.7, which first flew in September 1917. With the success of the J.I, he also designed the Cl.I, a two-sat fighter and ground attack aircraft quite similar to the J.7 in overall look. The J.7 and its more developed version, the J.9, first appeared in public at the Second Fighter Competition in June, 1918. The design was stunningly revolutionary, representing as it did the future of aircraft design. Incorporating a lightweight corrugated aluminum skin over a metal structure, the airplanes were free of all drag inducing struts and rigging wires. One can consider it amazing that aviation development had come this far in only 15 years since the first flight of the Wright Brothers. Unfortunately, fighter pilots are generally a conservative lot, who have had to be dragged kicking and screaming and fighting every inch into each new development of fighter aviation since the first gun was put on an airplane. The ace pilots assigned to test the new designs at the competition saw the J.9 as heavy, while its low wing design restricted downward visibility. They were far more favorably disposed to Fokker’s far less revolutionary E.V parasol monoplane, though Bruno Loerzer and Herman Goering saw potential benefits from the design and recommended using it to attack balloons. Powered by a 180 h.p. BMW engine, the J.9 had a performance of 119 m.p.h. maximum speed, and a service ceiling of 19,685 feet. While it was not as maneuverable as a biplane, its speed and performance in the vertical plane made it superior to any biplane if the pilot was using the proper tactics. Idflieg saw the design’s potential and ordered 40 as the Junkers D.I. Unfortunately, Hugo Junkers had no concept of “mass production,” since he had been essentially conducting experiments with one-off designs since he founded his company. Idflieg had prevailed on him to join forces with Anthony Fokker, who did understand modern production techniques, and an affiliate company, Junkers-Fokker, was formed in August specifically for the production of the J.I, and then the D.I following the Second Fighter Competition, while Junkers worked with Linke-Hoffman - who had extensive experience in construction of metal airships - to produce the two-seat Cl.I ground attack aircraft. In the four months between the receipt of the order and the end of the war, only Junkers produced 15 D.Is, while Junkers-Fokker managed to produce 13 more, and 12 more were produced by the time the Allies ordered the cessation of all aircraft production in Germany in 1919. Only 6-7 arrived on the front by late October, where they were to equip the Marine Feldjastas in Belgium. None are known to have participated in combat. After the war, when Gotthard Sachsenberg and Theo Osterkamp formed a Freikorps based on the old Feldjastas to assist the new Baltic republics in their battle against the Bolsheviks in 1919. Sachsenberg commented that the D.I was the best choice for the constantly adverse weather conditions, since its metal structure was not affected by rain and dampness the way fabric-covered wooden structures were. As to what the D.Is specifically accomplished in these battles, little is known since there is sill almost no documentation on any of the fighting in that period. For those who wonder if “1919" would have been anything like “1946" had the war continued and the Germans introduced “wonder weapons” like the D.I, the sad truth is that the German aviation industry did not have the ability to engage in widespread production of such an advanced design, which would have resulted in the D.I never appearing in the numbers necessary to overcome Allied air superiority - a fate similar to that of the Me-262. During the First World War, there were only two truly radical advances in aircraft technology: the invention of the gun synchronizer, and the development of all-metal aircraft designs. The further development of fighter aviation was determined by these two events, though it would be another 16 years before all other designers finally agreed that Junkers had pointed the direction with his D.I in 1918. After the war, Hugo Junkers used his experience with the J.I, the D.I and the Cl.I to create modern low-wing all-metal aircraft beginning with the F.1 and continuing through the Ju-52, that set the standard for modern aircraft. The D.I and the Me-262 are equally revolutionary. 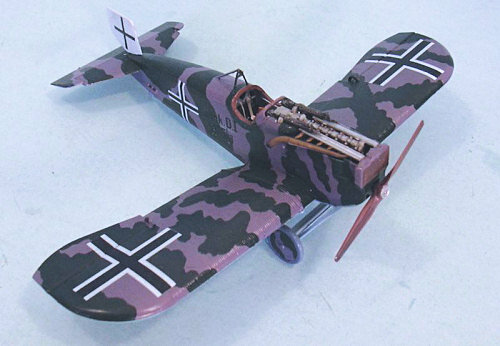 This kit by Roden is the first 1/48 kit of the Junkers D.I to be produced by a mainstream company, and follows their release of a D.I in 1/72 a few years back. Previously, Blue Max released a D.I in the early 1990s that was the first of their series of multi-media limited-run World War I kits. I bought one and it is reviewed here at Modeling Madness. This kit, which was extremely primitive even by the limited-run standards of the early 1990s, is now only available to those who want to shell out lots of money on eBay. It is now effectively completely obsolete as the basis of a model, with the release of this kit. 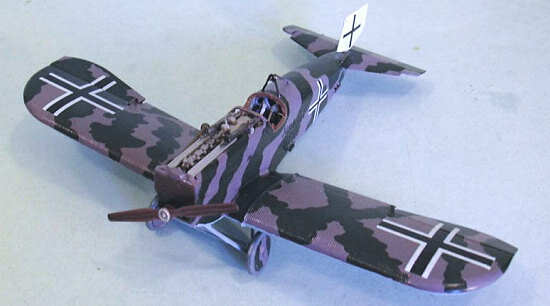 The kit is a “long-fuselage” early production version, which means that the alternative scheme with a brown fuselage - which is known to be a short fuselage late production D.I - is wrong for this kit. No one has ever been certain about the other airplane for which markings are provided, though the likelihood of its having made it to the front means it is probably a long-fuselage D.I. This airplane is listed has having been at the Western Front in Belgium in November 1918, and was also later photographed in Lithuania, where it served with the Freikorps Sachsenberg. I began construction by painting the interior parts aluminum, using Tamiya Aluminum. I then did detail painting of the engine parts, and gave the machine guns a coat of Tamiya “Smoke” to pop out detail. Assembly of the engine, engine compartment and cockpit was easy, with the parts fitting after only a very little cleanup. I did use photoetch seatbelts from Eduard, since the cockpit is so visible when completed. The external parts of the fuselage fit together so well I only needed to run Tenax along the joints and squeeze them to get everything together with no need of any seam filling. The wings were also easy. The control surfaces are all separate, so I posed them dynamically - after being certain to position the controls in the cockpit appropriately. Fit of the wings and tail assembly to the fuselage presented no problems. I finished off by attaching the landing gear and tail skid, while keeping the wheels and rudder separate until I finished painting. I used Xtracrylix RLM65 Blue for the lower surfaces, and RLM74 with a bit of red added for the upper surfaces. I hand-painted the green camouflage over this, using Xtracrylix RLM82 Dark Green. I like how Xtracrylix can be so easily hand-painted, which made the camo pattern - which was hand-pai nted on the original - easy to do. There have been complaints about Roden’s decals, but I haven’t experienced any difficulty with any of them since the second issue of their Fokker D.VIIs. These decals went down over the corrugated surface with only one application of Micro-Set and two applications Micro-Sol. I attached the gun troughs and guns, the main wheels and prop, and attached the rudder slightly offset. I think it can be fairly said that with this kit, Roden is now playing in the same territory with Eduard, though perhaps one or two steps behind, and is definitely the most advanced plastic model company in the former Soviet Union. This kit is so well-designed that it is perfect out of the box, with only a set of Eduard German seatbelts needed to give it an outstanding final look. 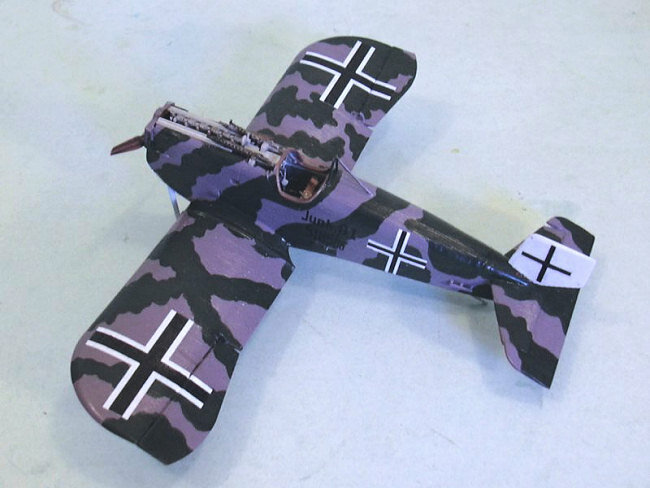 With Eduard dropping production of more World War I airplanes in 1/48 past the upcoming SPAD XIII and Fokker Dr.I kits, Roden looks to be “it” when it comes to more World War I models, which is not a bad future for the genre. Thanks to Roden for the review kit.